Whether you need simple, reliable spray equipment or sophisticated, robust computerized plasma controls, Praxair has a solution for you. The years of proven performance in our plasma is a reflection of Praxair's commitment and expertise in the field. All of Praxair plasma spray systems are simple to operate and easily integrated into any coatings environment. 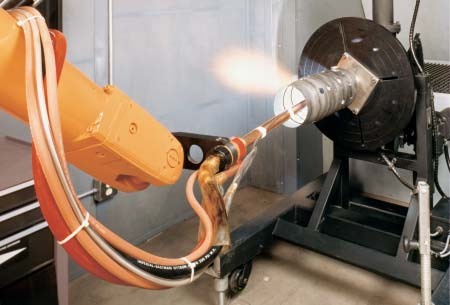 They offer a broad range of plasma guns that operate at power levels ranging from 20 kW to 80 kW and are versatile for most ID and OD applications. They also offer the revolutionary high power PlazJet II system that operates at power levels up to 220 kW. In addition, Praxair has a wide-range of plasma controls that extends from manual, critical-orifice gas flow controlled to mass-flow, closed-loop, PLC controlled. Each of Praxair spare parts and powders are manufactured to the tightest tolerances so that in combination with their plasma systems, you always operate at optimal performance.